When I have travelled in the past, I have always taken too much, and always wondered why my suitcase was always heavy. When I am home, I will wear lots of makeup, however when I am on holiday I will try to embrace the natural holiday look and keep my makeup to the bare essentials; foundation, concealer, mascara, blush, lip gloss, highlighter and brow products. 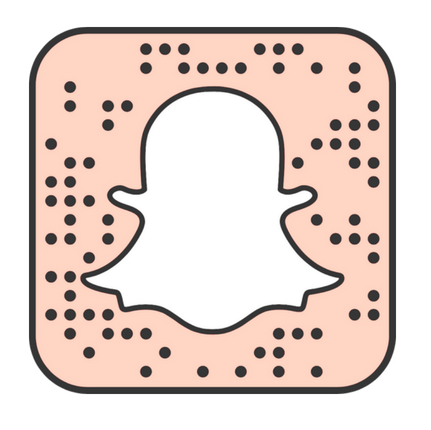 This is all I will take, which may seem a lot for some people, however if you saw my makeup collection you would realise that this is barely anything. If you want to take eyeshadow palettes and blush palettes, then my suggestion would be to try and find a palette that has some eyeshadows, some blushes, and maybe a bronzer and highlighter in it. 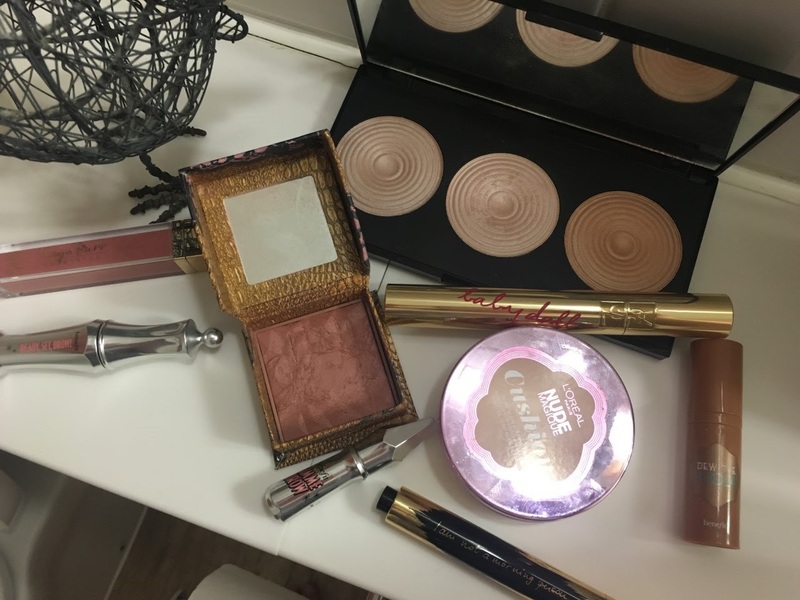 You can get some amazing full face palettes which do not cost a lot of money and may be beneficial if you travel a lot and want to wear makeup on holiday. 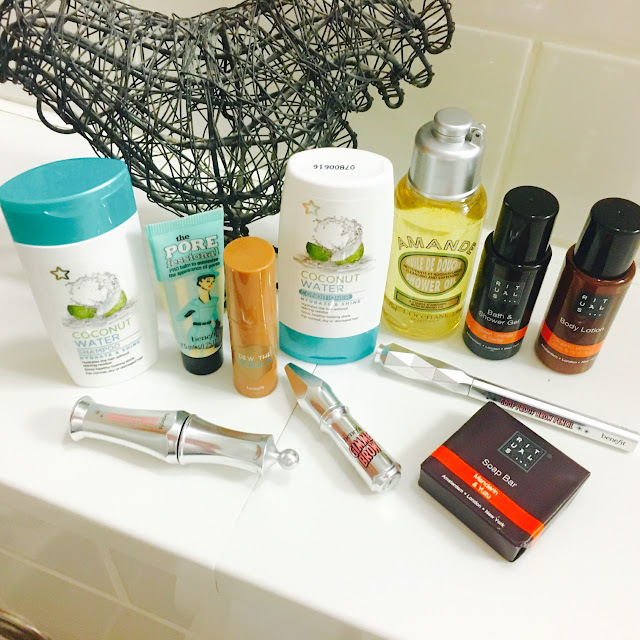 Also, when it comes to toiletries I will try and only take items that I really need. I don't need to take all my skincare products unless I am going away for three weeks and then maybe I will take a couple; however I would never take my face masks and all of my skin products because it would be a waste. Over the course of the year, I will try and collect mini versions of products that I use a lot. I do this quite a lot with makeup, especially if I am going away for just the weekend. Benefit is incredible for selling minis and recently they have been giving away quite a few minis in magazines like Elle and Marie Claire. They also sell some of the products in the mini version in drugstores for a reasonable price. I have a mini Porefessional, a mini Dew the Hoola and then a few of the new brow range in the mini size. Sometimes, it is not worth buying the mini version as it can cost quite a bit if you buy everything again, however I do usually buy a mini shampoo and conditioner when I am going away and then I will buy a cheaper full size bottle when I am away. Quite a few hotels abroad will have stores in the resort or there will be local drugstores near to the hotel; my advice would be to look at what kind or stores are nearby before travelling and then you will have a rough idea on what toiletries you should take. 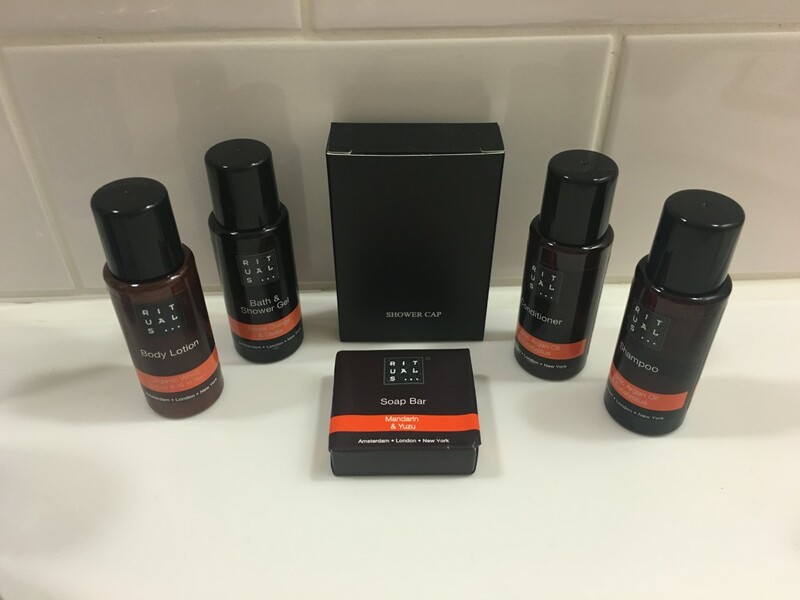 Also, hotels will usually provide shampoo and conditioner and body lotions in the bathroom, so it may be useful to go on their website to see what is provided in the room. 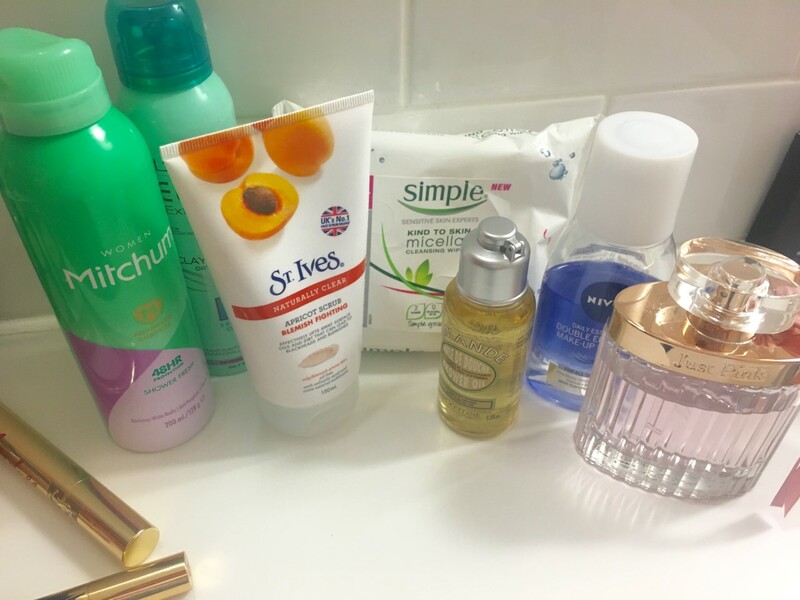 I will try and buy most of my toiletries when I am away and then when I am leaving I will hand in any toiletries into the desk, as they will sometimes have boxes to put leftover toiletries for other guests to use if they forget anything. When I have gone away with family in the past, we have often taken individual toiletries which have resulted in us taking similar products or even the same toiletries. Therefore, to stop you taking too many toiletries it may be an idea to try and just take products that the whole family can use, rather than taking individual items. The way I see it is if I share some products like moisturiser and body lotions, I will have more space in my suitcase to bring back more clothes and makeup! If you have a product that you cannot live without; then one tip would be to decant your favourite product into smaller travel size bottles. You can buy clear travel-size bottles from local drugstores, supermarkets and even some high street stores will sell then (like Primark!). What I love about these is that you will usually get a few 100ml bottles and then a couple of pots, so you could decant your favourite body lotion, moisturiser or even you face cream. These are perfect to take onto the plane; especially if it is a long haul flight. I often do this with my skincare, as I don't want to take loads of big pots of skin cream, so I find it easier to buy smaller pots and decant it into them instead. Also if my suitcase was to get lost, I wouldn't worry about losing expensive skincare products, unlike if I took the full size version. 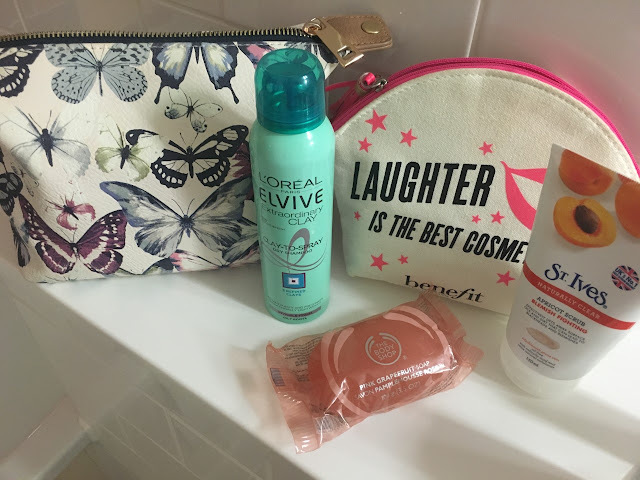 I hope these tips will help to keep you cosmetics bag slightly lighter and a bit more organised, as I am not keen on packing and find it so hard to know what products I should take.